The following chart helps us guide you to the appropriate Arabic class for your level. Please respond as accurately as possible to register for the right class. If your situation does not fit neatly into the following chart or if your circumstances are not well described here, please contact Professor Elizabeth M. Bergman of the Arabic program. Please find the statement(s) that describe you most accurately. 1) I graduated from high school in the US and also finished junior high or middle school in the US. 2) I graduated from high school in the Arabic world. I studied Arabic in high school. 3) I finished middle school or junior high in the Arab world. I studied Arabic in middle school or junior high. 4) I took Arabic (as an academic subject in a classroom) during the last academic year or this summer. Please go to Step 6. 5) It has been a year or more since I last studied Arabic in the classroom. I did not take Arabic during the last academic year. Find the class that would be right for you if you had studied Arabic last year, then drop down a level. For example, if the class that is right for you would be ARB 201, but your last Arabic class was a year or more ago, please register for ARB 101. Or, if the right class for you would be ARB 301, but your last Arabic class was a year or more ago, please register for ARB 201. If these books look familiar, please go to Step 7. If these books do not look familiar, please go to Step 8. 7) Please read the following statements and register for the last or highest level that applies to you. My Arabic class(es) used the Alif Baa and Al-Kitaab textbooks. We completed all of Alif Baa, but did not go on the Al-Kitaab. My Arabic class(es) used the Alif Baa and Al-Kitaab textbooks. We completed all of Alif Baa and Lessons 1 – 2 of Al-Kitaab. My Arabic class(es) used the Alif Baa and Al-Kitaab textbooks. We completed all of Alif Baa and Lessons 1 – 6 of Al-Kitaab. 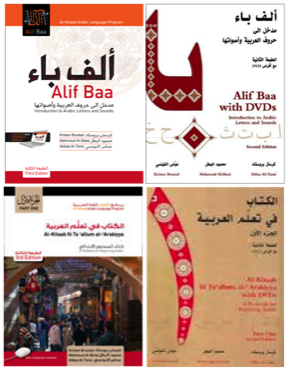 My Arabic class(es) used the Alif Baa and Al-Kitaab textbooks. We completed all of Alif Baa and Lessons 1 – 8 of Al-Kitaab. My Arabic class(es) used the Alif Baa and Al-Kitaab textbooks. We completed all of Alif Baa and Lessons 1 – 10 of Al-Kitaab. My Arabic class(es) used the Alif Baa and Al-Kitaab textbooks. We completed all of Alif Baa and Lessons 1 – 12 of Al-Kitaab. My Arabic class(es) used the Alif Baa and Al-Kitaab textbooks. We completed all of Alif Baa, Lessons 1 – 12 of Al-Kitaab, Volume I, and Lessons 1-3 of Al-Kitaab, Volume II. 8) Please read the following statements and register for the last or highest level that applies to you. My Arabic class(es) did not use the Alif Baa and Al-Kitaab textbooks. I can recognize and write some/most of the Arab alphabet but do not always understand when I read Arabic. I speak very little Arabic. My Arabic class(es) did not use the Alif Baa and Al-Kitaab textbooks. I can speak some Arabic, but I cannot read or write Arabic. My Arabic class(es) did not use the Alif Baa and Al-Kitaab textbooks. I can read and write the Arabic alphabet and can write short, familiar sentences. I can introduce myself to another person and answer simple questions about myself. My Arabic class(es) did not use the Alif Baa and Al-Kitaab textbooks. I can use the vocabulary I know to read and write short sentences about myself and others, even when the sentences are new to me. I read and write mostly in the present tense. I can use the vocabulary I know to have short conversations about myself and others, even when the questions and answers are new to me. I speak mostly in the present tense. My Arabic class(es) did not use the Alif Baa and Al-Kitaab textbooks. I can use the vocabulary I know to read and write paragraphs about myself, my daily activities, and my plans for the future. I can recognize and use the past tense, the present tense, and the future. I can hold conversations about myself, my daily activities, and my plans for the future. I can talk about past, the present, and the future. My Arabic class(es) did not use the Alif Baa and Al-Kitaab textbooks. I can use the vocabulary I know and my knowledge of Arabic grammar to read and write about a page on familiar topics. I have some knowledge of the grammar of standard Arabic and can use an Arabic dictionary. I can hold conversations about familiar and unfamiliar topics even with people who are not used to speaking to Arabic students. My Arabic class(es) did not use the Alif Baa and Al-Kitaab textbooks. I can use the vocabulary I know and my knowledge of Arabic grammar to read and write a page or more about familiar topics as well as on topics in the history, geography, and culture of the Arabic world. I have good knowledge of the grammar of standard Arabic. I can speak well on familiar and unfamiliar topics that include myself and my plans, as well as the history, geography, and culture of the Arab world.